What is "Metaliterature"? It is literature about literature, in this case, views, reviews, and thoughts provoked by stuff I've read. I'm hoping this might be a chronicle of the brain of a life-long reader as guided by intertextual coincidence. If you like what you read, read what I like. Currently domiciled in the Vale of Glamorgan. Charles Portis currently serves as my literary palette cleanser. Between long, meaty meals of literary or indeed any sort of fiction wherein my patience and stomach is tested to the max, a sweet, sharp bowl of Portis resets my flagging will ready for the next serving. His sorbet is a particular blend of surrealism and realism, all usually hung on a mythological hero quest. Things do not go well. Of course, Midge gets his girl (although the car is a write-off), but, in a discomfortingly off-hand way, right at the very end, Midge reports that Norma runs off to Tennessee and he's not unhappy to see her go. The Doc, well, he disappears never to be seen again. 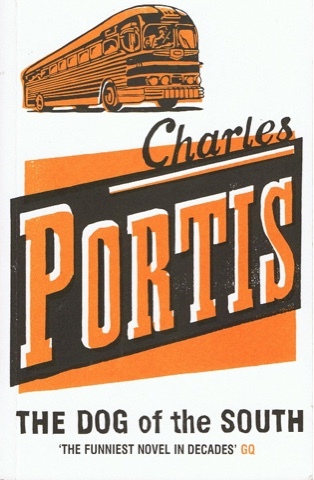 It's a typical novel, of the few that I've read, by Portis. The protagonist (and narrator) is earnest but ill-informed, and is quickly overtaken by events (events, dear boy, events*) until he is lost far more than that for which he went in search. However, the commonalities don't end there. The cast of characters drift in and out, some never to return, some to pop up unexpectedly like the bail bondsman Jack Wilkie. It's immediately funny, it's deeply funny, and it's reflectively funny; it's odd, and unsettling, and brilliant. Just the thing with which to put Tad Williams to bed. I bought this on the recommendation of someone whose opinion I respect if not always agree with, and also as it was an Amazon daily deal I felt that 99p or whatever it cost was not too much to risk. I have become a little narrow in the field of what I choose to read and welcomed the digression offered. Subsequently, I feel a little hoodwinked. Metaliterature - what meaning to have is this for meaning? Not a review this time, more of a curiosity. It seems I'm receiving lots of hits from Russia (Здравствуйте России!) from people searching for the definition of "metaliterature". As such, it is something of a bespoke word, created to fit a need and probably not yet recognized outside literary theory / criticism circles (Merriam-Webster Online certainly don't like it). I was wondering what they typed in to end up here, so, for fun (it's not fun, sorry) I thought I'd bung it in Google Translate and see what came out. As it turns out, one needs a little hyphen for the rather ponderous machine to understand it, and even then only does half the job (meta seems to be meta in any language). Someone told me this novel, now nearly thirty years old (holy crap), Nick Cave's first and, possibly, his best, began life as a screenplay when he was still touring with The Birthday Present. That seems equally plausible and implausible. It is a wildly cinematic novel, narrated in flashback by the hermetic mute boy Euchrid Eucrow, who slithered into the world as one of a pair of damaged twins, the only one who survives the neglect of their first day on earth, and is vividly, viscerally visual. But it's also complicated, wildly imaginative, and at heart, finds a safer and more permanent berth in the gently revered world of literature than in the ever-changing and perfidious zeitgeist of cinema. Opinions for hire. Payment in books accepted.